I am walking with many people on a road, that leads to nowhere. Suddenly I have a feeling that I am being followed by no one. I look back. There is no one there. I get a feeling that nobody’s leading me either. I look straight again. I am walking alone. Everything has disappeared. I realise that I am walking on a thin but straight thread, and am amused by the perfect balance that I have been maintaining. But no more. Now I am feeling dizzy. The Acrophobia grips me. I look down. There is a vast stretch of nothingness. I try to keep walking, and raise my left step very carefully. I am trying not to loose my balance. I touch the thread with my raised foot. To find a base, to move forward. But as soon as I touch it, darkness creeps in. I can not see anything. The thread, the vast nothingness, the balance… all gone. I stand still. A cold fear. A raw admonition. A dark hunch. And then red shadows spread all around, bringing into life red rays out of nowhere. And the whole space goes red. Red walls, red floors, red hopes. 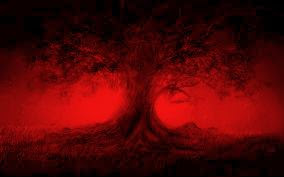 And darkness reds off my heart, spreading a mystical ambiance outside, and inside.